Nicholson's pub in Aldgate. Note that it's not open at weekends. The Nicholson's website proudly claims that this pub is "famous for being a timber-framed survivor of the Great Fire of London", having been just 50 yards away from the closest approach of the fire. 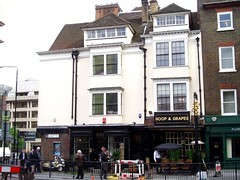 However, the building has obviously been amended since, and the frontage doesn't look unusually old at all. The interior is fairly interesting though, with various different areas, including a glass-roofed and brick-floored area that appears to have been an enclosed courtyard at some previous point. The range of seating options is vast, with booths, banquettes, high stools, half-round leather armchairs, and sofas. The flooring varies too, from the above-mentioned brick through stone to wood. Kake and Ewan visited on a Monday early evening in September 2011. There were plenty of people in when we arrived a little after 6pm, but quite a few tables free too. Music was playing, but drowned out by conversation. Three of the four handpulls were on, offering St Austell Tribute, Sharp's Doom Bar, and London Pride (these appear to be the regulars). Upcoming guest ales were advertised on a board and with pump clips behind the bar. They also had two boxed ciders, both from Westons: Old Rosie and Traditional Scrumpy. According to the Nicholson's website as of September 2011, food is served 10am-10pm Mon-Fri. We tried the sharing platter (£10.45) photo, which included chicken and chorizo skewers, cumberland sausages in mini yorkshire puddings, calamari, scampi, onion rings, and crispy baby potatoes. This was billed as "perfect for two, enough for three", though we might quibble with the second half of that claim. Overall, it was OK. The chicken and chorizo skewers were a lot better than expected, with the chicken not dry at all, and there was a good flavour of black pepper in the batter enclosing the deep-fried mushrooms. The calamari were ridiculously overcooked, though. Accessibility: A small step and then a larger step to get in. Toilets are in the basement, down a flight of stairs with a couple of landings and a sturdy handrail all the way down. Last edited 2013-05-10 07:21:32 (version 2; diff). List all versions. Page last edited 2013-05-10 07:21:32 (version 2).